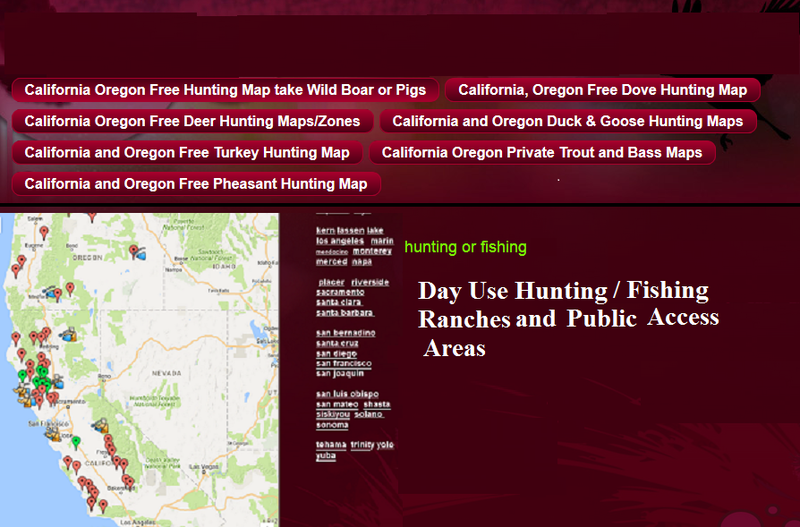 Enjoy our Report and Map, we have many more plus info on private hunting ranches and clubs. Fill the form below to receive weekly reports, new maps and be contacted for any openings for clubs or ranches day hunts in your area. The lake is about half capacity and the bass action for the spotted version is continuing in the river arm but pretty deep at 20 to 30 feet has been the best bet. Fish above Finegold, Zoom Trick Blue, Gold, sculpin Worms patterns around deeper any rock protrusions. Location: Millerton Lake is located 20 miles north east of Fresno and 20 miles east of Madera in central California. Size: More than 3 miles wide at its widest point and more than 16 miles long back into the river canyon. Millerton features 43 miles of shoreline. Camping: Nearly 100 developed sites for tents, RVs and trailers and nearly 40 primitive sites for tents at Fort Miller. A boat-access-only camp is located at Temperance Flat with tables, stoves and water. Boating: Launching ramps are located on both sides of the lake, south and north shores. No waterski- ing is allowed east of the Finegold day-use area, hence, fishing is good upriver in the summer. Species: Smallmouth, largemouth, spotted and striped bass, catfish, American shad and crappie. Millerton Lake anglers will ﬁnd a wide variety of warm-water dwellers in this large Central Valley water, including smallmouth, spotted, largemouth and striped bass. The lake was formed in 1944 when the construction of Friant Dam backed up the cold waters of the San Joaquin River. It‘s a very large lake that features 43 miles of shoreline — it’s 3 miles wide at its widest point and stretches more than 16 miles long in Madera and Fresno counties. Needless to say, there’s a lot of water — and you can always catch ﬁsh in this lake. Most of the ﬁsh are, indeed, bass, but anglers will ﬁnd catﬁsh and a smattering of crappie and catﬁsh. There are no trout, but anglers can head upriver for a quick rainbow ﬁx. Smallmouth bass are by far the biggest attraction, and although Millerton Lake bronzebacks don’t reach record- class proportions like Trinity Lake ﬁsh do, there are certainly some top quality bass to be had. There are a lot of throwbacks, and anglers will probably catch three to ﬁve sub-12-inch ﬁsh for every keeper, but there some lunkers in there too. ,Millerton has some of the best smallmouth bass ﬁshing in this part of the country, Pine Flat is good too, but is the top smallmouth bass ﬁshery around, especially if they ﬁsh the areas we've marked. Best bass bets on Millerton is Rocky points and coves on the north side near the dam. Try Winchell Bay, Finegold Creek area, South shoreline upriver from Finegold and Temperance Flat. Anglers will ﬁnd smallmouth off the rocky points all over the lake, but the key to successful ﬁshing is to fish all over on the rocky points, but specifically anglers should look for odd-shaped points, rocks and coves for best results. Boaters equipped with ﬁsh ﬁnders will have a big advantage over those who don‘t. Because of its huge size, Millerton would appear to be a difﬁcult lake to ﬁsh, especially for the novice or ﬁrst- time bass angler. But if you concentrate on certain areas of the lake, you can always score. Drive past Friant Dam and start ﬁshing rocky points and coves on the north side. Throw 4-inch worms at the time of year when small- mouth are getting ready to spawn. If temperature is cold still, ﬁsh them real slow, the bass are still somewhat sluggish, but anglers who jig the baits from the shallow shoreline to 30 feet of water will catch ﬁsh. Smallmouth will move into shallow water— 5 to 10 feet — in mid- March and April when they spawn, then they’ll move back into deeper water. For this latter time, throw nibbler (small grub like rubber worms) baits in 5 to 30 feet of water. Later, start tossing crankbaits and spinner- baits toward the shoreline. Winchell Bay is an excellent small-mouth bass producer. lt features big, heavy rocks and bass move in and out of there before, during and after the spawn. Work the rocky points and walls along the face of the scenic area, but don’t spend too much time there. Head upriver and start ﬁshing the Finegold Creek area. This is an excellent small- mouth bass area, and bassers should spend a lot of time throwing baits toward all the shores. One of the best ways to catch bass here is split-shotting because most all of the banks have a good angle that you can really walk it down. Grubs or California Worms are excellent bass-catching baits, brown worms with an orange tail or brown worms with a chartreuse tail for the hungry smallmouth. Moving upriver, anglers should concentrate their efforts on the south side of the arm. There’s a good chance you'll hook a black bass in this area, as well as striped bass are also numerous and ﬁshing is productive from March through July. Temperance Flat is an excellent largemouth and Kentucky spotted bass producer, and anglers will ﬁnd some good striper action too. Head east as far as you can go and you’ll catch blacks throughout Tem- perance Flat. Blacks are also available in front of the dam. Improved campgrounds for RVs, trailers and tents are available all over the lake, and there are some excellent boat camps available at Winchell Cove and Temperance Flat that are accessible only to boaters. During the summer, Millerton attracts lots of water skiers, but they can’t go past Finegold Creek, and that’s good news for anglers because the best bass ﬁshing in the summer can be found in the cool San Joaquin River channel as well as the dam area. The early summer is hot for top- water action, cast Rebel Pop-Rs, Cordells and Rapalas for blacks and stripers! The good ﬁshing never seems to end at Millerton! Fill out form below for Hunting Club member or Hunting Ranch Manager to contact you. Make sure to put your city in the message section so we know we where your located. Picture Window theme. Theme images by ADDeR_0n3. Powered by Blogger.